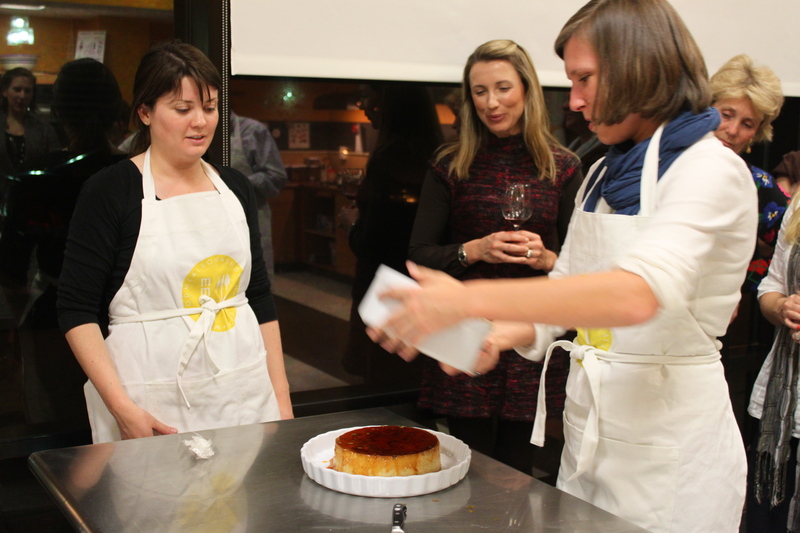 I had great fun adapting my mother’s flan recipe into a seasonal treat for my Fall Off Mendenhall Cooking Class. Pumpkin was an easy addition and I crafted the spices from other pumpkin flavored fall treats. This process was also was fun because I had to test the recipe a couple of times to make sure it was perfect. I was excited to share the recipe and show how easy it is to make a flan with my class. 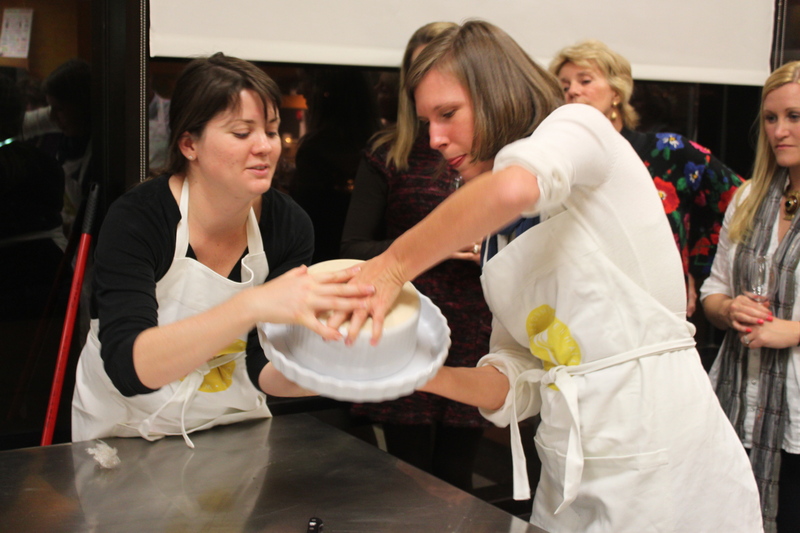 My new friend Meghann took the challenge of flipping the flan in class. She had a crowd watching and recieved great applause when the flan came out perfectly! That is brave! This dessert is perfect for this time of year, very easy and great for advance dinner party preparation. Beat 6 eggs in one bowl. In another bowl, combine 1 can of evaporated milk, 1 can of sweetened condensed milk, 1 can of water (use the sweetened condensed can for measuring) and half of a can of pumpkin puree. Strain the eggs into the milk bowl and then add vanilla. Then add cinnamon, ginger and nutmeg. Wisk together to combine. Heat about 1/2 cup of sugar in a skillet until golden. You will need to keep scraping the skillet to prevent burning. This stuff is HOT so be careful. Do not stop stirring and scraping until it is ready. Pour it into the bottom of a large ceramic dish and swirl around to cover bottom. If it does not completely cover, don’t worry. Sprinkle pumpkin seeds on top of the caramel. Pour in the flan mixture and put the dish in a water bath. Cook at 350 degrees for about 1 hour and a half. Jiggle the dish to see if it isn’t liquid like – but still moves. Refrigerate at least overnight. To plate, run a knife around the edge of the dish a couple of times to separate. Then flip quickly onto a platter.